Old Blood Noise Endeavors is the latest US boutique builder to burst onto the scene with some radical ideas about design, tone and, it seems, philosophy. Now we’re giving you the chance to win one of the company’s uniquely eccentric multi-effects stompboxes in the shape of the Excess – a combined distortion and modulation pedal. “We live in a time of Excess,” says OBNE on the front page of the manual to this baby pink noisemaker, and excessive sounds are the name of the game here. If you thought that lashings of high-gain distortion layered with chorus and delay went the way of the buffalo when guitarists threw away their hairspray and codpieces at the end of the 1980s, well think again, because the Excess offers all three effects in one unit. The clever thing about the Excess is that you can choose just what flavour you want your 80s rock goodness to come in. With footswitchable control of chorus and delay, you can choose if you want your high-gain sound to be complimented by lush chorus or evocative slapback, and there’s independent volume controls for both distortion and modulation so you can tailor the balance to taste. The Excess also offers you control over the signal path of the two sounds thanks to the series/parallel switch. In series mode, the distortion effect flows into the modulation effect, stacking their sound and volumes. In parallel mode, the two effects are summed to a single output, resulting in a clear modulation with a distorted layer underneath, cleanly separated. 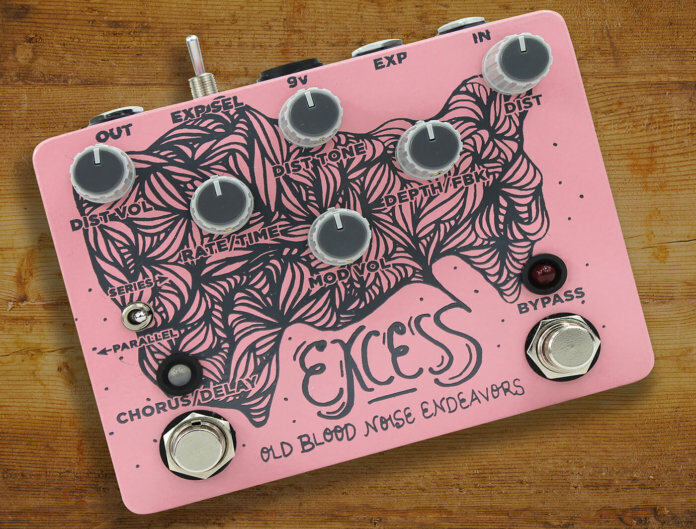 It all adds up to a pedal that OBNE says will create sounds that are “over the top, eccentric, usefully useless” that both hark back to the 80s but also create something totally new. If that sounds like your thing, head to oldbloodnoise.com to find out more about the firm’s effects. The closing date is 12.00am GMT, 10 December 2018. The editor’s decision is final. The competition is open to UK residents only. By entering The Guitar Magazine competitions, you are agreeing to receive details of future promotions from BandLab UK Limited and related third parties. If you do not want to receive this information, you can opt out. This giveaway is open to over 18s only. For full terms and conditions, please go to bnd.la/gm-ctos.